HKSAR Film No Top 10 Box Office: [2018.01.04] LAW KAR YING DOTS HARRIET YANG'S "EYES"
[2018.01.04] LAW KAR YING DOTS HARRIET YANG'S "EYES"
Harriet Yeung Sze Man recently worked with Law Kar Ying, Michelle Wai Sze Nga, Mak Cheung Ching, Lam Yiu Sing and Sam Chan Yu Sam on the film SAI FONG YAU GEI ji TONG JUNG CHAI CHOR GAI (WESTERN LIE JOURNEY CHRONICLE: TANG MONK CROSSES THE LINE). Earlier it was Hatou's 42nd birthday. Producer Chan Ka Lok arranged for a birthday cake as a surprise. Her manager boyfriend Dean Shiu Tsz Fung visited the set. 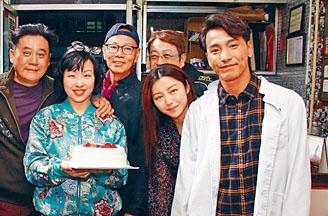 After a group photo, the birthday girl embraced each cast mate. Brother Kar Ying even mischievously "dotted" Hatou's "dragon eyes" with cream. Siu Tsz Fung presented his gift. "Although I didn't prepare a ring, this gift is very meaningful. It's an Indian craft dream catcher, legend has ut that it can capture good dreams when hung. In it is my Morse code 'you are not alone'. We can put it on the headboard to chase dreams together. Ha, I never expected to chase dreams when I am several decades old!"